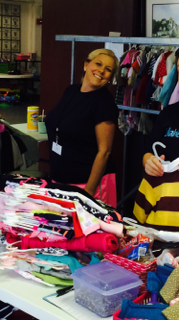 Volunteers Shop Early & Earn Sale Cash! Volunteers are the Heartbeat of Lullabies and Mudpies! The more we grow the more determined we are to invest in quality! We depend on you, our wonderful volunteers! Your time, skills and resources are invaluable contributions to the overall success of L&M. We cannot handle all of the finer details that make our sale great without you! Thank you! Interested in Joining our CORE TEAM? For safety precautions all volunteers must be 16 or older. For our Teen & Military Volunteers we are able to offer written verification of community service hrs for colleges/work etc. As a reminder we are not able to have children during work shifts unless you are able to wear them and you must agree to no liability for child during help times. We always have things moms can do lots of jobs sitting, walking, we have something for everyone just inform us if you have limitations so we can find the perfect task for you. If you see you will not be able to make your shift or meet your commitment for a bartered shift please contact us prior to the shift. We do understand family emergencies and sickness, etc. No shows without contact will result in being permanently prohibited from volunteering. THIS IS STRICTLY ENFORCED. You will provide one gift card to a nearby restaurant ($25 value) to help feed all of our hard working volunteers. Please email info@lullabiesandmudpies.com if you are interested in this. You can shop at our Super Consignor presale. Get Lullabies and Mudpies in the media! If you can get us radio, TV or print coverage you’ll earn volunteer hours. The number of hours will vary depending on the media coverage. Email info@lullabiesandmudpies.com for additional info. Lullabies & Mudpies is currently hiring for our CORE team! All workers can cancel or reschedule their work shift(s) and avoid penalties by changing online prior to online tagging and entry closing which is usually a day or so before drop off. If after closing please email info@lullabiesandmudpies.com and reschedule your shift at least 24 hrs BEFORE the scheduled shift(s) to avoid penalties. (Penalty is a 25% reduction of your incentive payout from your consignor check and/or not allowing future participation in our events. If you have received incentives such as Mudbucks we will take this amount from your consignor check if you do not fulfill your obligated shifts.) We rely on our volunteers and we reward upfront for shopping and incentives so please do not forget to let us know if you have had an emergency come up. It is your responsibility to sign IN and OUT when you work. This is your record to receive appropriate worker credit. If you are not a consignor and would like to volunteer please contact info@lullabiesandmudpies.com and we will discuss your registration. Do not worry if you’ve never volunteered before, we will show you what to do when you arrive. We need you to arrive 10 minutes before your shift to get a little training. Volunteers help as runners/organizers during drop off, bagging for customers during the sale hours, straightening clothing on racks, and organizing items on sale floor. Each shift will have a meeting and assignments given so you will always know what to do. We have a lot of fun and our volunteers say that it helps them to appreciate how the event runs and just how much work is involved to see it first hand. The biggest perk is we are all like a family and enjoy spending time together…we all look forward and count down to the sale. Consignors who are volunteering will be placed on our exclusive presale list. We will provide water during your shifts. If you would like to bring your own lunch etc. we will have a refrigerator or area for you to store your cooler/bag. Wear comfortable shoes and clothing. We provide a cute L&M apron and name tag for you to wear during your shift. Volunteers will be shopping during presale times only. Drop off volunteers may get a sneak peek at the merchandise but cannot purchase or hold items.